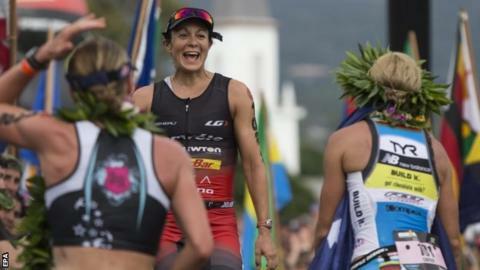 Britain's Rachel Joyce finished third in the women's Ironman World Championship in Hawaii as Australia's Mirinda Carfrae won her third title. Carfrae completed the 2.4-mile swim, 112-mile bike ride and marathon 26.2 miles run in nine hours, 55 seconds to defend the title she also won in 2010. Joyce, second last year, was beaten into third by Switzerland's Daniela Ryf. Briton Jodie Swallow was fourth. Germany's Sebastian Kienle won the men's race by more than five minutes. Kienle, 30, finished the ocean swim in 54:38, the bike ride in 4:20.46 and the run in 2:54.36 to set a winning time of 8:14.18. American's Ben Hoffman took silver in 8:19:23 while Germany's Jan Frodeno was third in 8:20:32. Britain's best male finisher was James Gilfillan, whose time of 8:59.47 saw him cross the line in 31st place.